American English language learners, admin assistants, authors, business professionals, ESL students and teachers: Sharpen your language skills every week with Word Tripper of the Week and multiple bonuses! Plan your promotional campaigns in a way that educates. 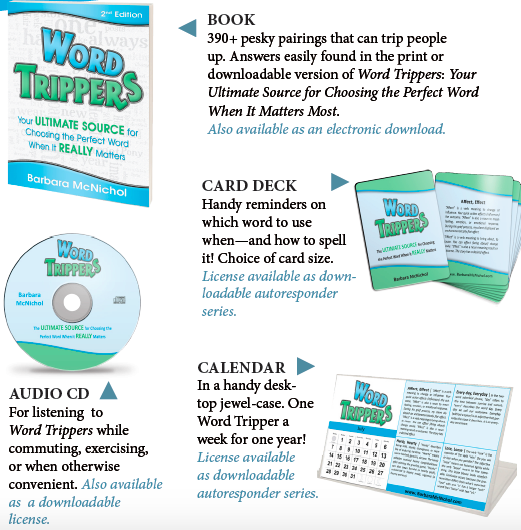 Use Word Trippers–book, card deck, word magnets, calendar, or audio CD—as a bonus, reward, or client giveaway. Make it a win-win for your organization and your clients! Select from the formats shown here or discuss one that works for you! Consider Bulk Sales and/or Licensing.